Finally, here are my first two books in my #20BooksOfSummer challenge (for more info on the challenge, see my first post on the topic). These are not connected apart from by virtue of being part of the project, and of standing a little outside the main run of the TBR, “Patricia Brent, Spinster” being an ebook and “Oxford Guide to Plain English” having lived in a little pile of what I like to call “books for work”, separate because you never know when you’re going to want to/have to read them. Oh – another link – both of them fill in gaps in my Reading A Century project, too, which is another reason why I wanted to get them read, apart from mere tidiness. OK, OK, Simon from Stuck-in-a-Book and all the other people who exhorted me to read this novel were right. It’s charming, delightful, a dear of a book and unputdownable. Patricia Brent is only in her 20s, but is marked down as a lonely spinster by the fellow inmates of the rather pretentious boarding house she inhabits in London. Sick of their goading and cattiness, she resorts to inventing a fiancé, and then weaves her way into a delicious web of deceit when challenged somewhat passive-aggressively to prove it, springing upon a hapless chap in a cafe and persuading him to take part in her misleading ploy. Of course, then the chap in question turns to (seem to) be actually keen on Patricia, and starts to send her flowers and telegrams, but she’s that horrible combination of proud and embarrassed, and a whole comedy of misunderstandings and crossed wires starts to develop, helped along by the quite horrific fellow-boarding-house-dwellers, the “rising politician” whose secretary Patricia is and his dreadful wife and her marvellous father, and the background of London coping with World War One, ever present, and intruding dreadfully in one scene. What with a Troublesome Aunt, a solicitious major domo at the boarding house who moves subtly from caricature to rounded and sympathetic character and a set-piece which shows all of the characters for who they really are, plus the breathless Lady Peggy who inexorably gathers the main characters under her win, it’s a cheerful and very funny book with a strong and interesting core and a heart-warming story, very akin to those Persephone Books stalwarts about Miss Pettigrew and Miss Buncle. Charming. Here’s Simon’s original review which made me want to read it and here’s my friend Ali’s review, too! This book fills in the year 1918 in my Century of Reading and is Book 1 in my 20 Books of Summer challenge. This book will appeal to anyone who loves the aforementioned Miss Buncle and Miss Pettigrew; anyone interested in social changes and society in the First World War. It’s written – of course – in a clear and also approachable style – not too personal and overbearing, either (there is a funny section about a small argument with The Telegraph about split infinitives). It concentrates on factual report and letter writing, but the general points extend to all kinds of writing except the most literary and/or experimental. The fact that I didn’t find anything that surprising, shocking or new suggests that I can be reassured that I’m on the right track with my own writing – hooray! Overall a useful book that should be added to the shelf of anyone who writes for a living or for pleasure. This book will appeal to anyone interested in writing. By the way, if you need a Plain English editor, my friend and colleague Laura Ripper is qualified in Plain English. This book fills in the year 2009 in my Century of Reading and is Book 2 in my 20 Books of Summer challenge. 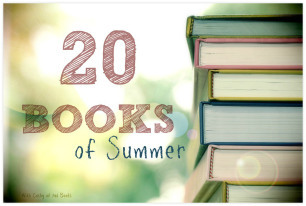 Yes, yes, I know, I sign up for #20BooksOfSummer then I read books that aren’t on my list. Tut, tut. But look, one of them is a really short pony book and the other is part of my “Read all of the Forsyte Saga in 2015” thing and I was already reading it when I decided to do 20Books. And there is some 20Books news at the end of this post, anyway … So, two books that basically have nothing in common, except I think “The Silver Spoon” might mention a racehorse or two. Oh well! The lovely Verity sent me this one, and was one I didn’t have. I do love the P-T sisters’ books but I still have a patchy collection – and I imagine this is part of a series, although it might be a standalone. Anyway, in a slightly more modern pony book under the Armada imprint (pony books stopped for a while and are now A Thing again, with more sparkles this time round), Vivien and Jon are packed off to stay at a racing stables belonging to a family friend while their parents conveniently jet off to Russia. Their host’s elder daughter, Angela, is a bit older than them and very much more into clothes and boys than they expected, and there’s a fair bit of description of floaty, cheesecloth tops and masses of inappropriate jewellery (which is the bit that makes this 1971 novel more of a modern one, as all of the characters in these books are usually reliably horse-mad). Of course, there’s a bit of a mystery to solve, and some lurking around in horseboxes trying to discover The Truth and misapprehending things horribly. There’s also a lovely description of what it’s like to ride a racehorse (on an exercise trip) after spending most of your time on hairy ponies. There’s lots of stableyard politics, too, with one boy getting a bad name for himself and, of course, only our heroes able to save him. Or should they even try to? It’s nicely done with a Jill-like sense of humour and the story, of course, works well. This book fills in another year in my Reading A Century project – 1971 done and dusted and I’m ALMOST half-way through the challenge now! This book will suit anyone who read(s) pony books, then or now. You can’t go wrong with a Pullein-Thompson sister! The completely and utterly middle volume of the nine books in the complete Forsyte Saga, so we’re over half way through now (wah!). We remain with Fleur and Michael and their respective fathers, plus a new dog (the demise of the Peke is off-stage). Fleur is busy establishing herself as a Society hostess and collecting people as ever, while Michael is working his way through the first stages of being a new Member of Parliament, unfortunately having espoused a rather crackpot political ideology known as Foggartism, which isn’t very popular and makes him less so, even leading to a disastrous attempt at a practical application of the theory, which ends in chaos and notoriety, naturally, all on account of him not knowing his own beliefs firmly enough. When Bright Young Thing Marjorie Ferrars insults Fleur in her own home, at her own party, and both Soames and Fleur retaliate, with a comeback at the time and some somewhat catty and indiscreet letters, respectively, Soames weighs in after the fact and sirs things up, leading to all sorts of embarrassment and the chance for the author to pick over “the new morality” and issues around censorship of fiction. Meanwhile, Jon Forsyte’s American brother-in-law manages to get himself mixed up with both sides, and an old danger rears its head, too. Galsworthy appears to relish painting his portraits of high society and political circles, especially perhaps Marjorie and her colourful in appearance and character grandfather. It’s interesting seeing the familiar Forsytes set against these new backgrounds, too, and this aspect of the book, and the way in which characters are interlinked, can’t help but remind me of the “A Dance to the Music of Time” novel sequence. We also get a good meditation on the pull between public office and private life, as Fleur becomes restive and can’t see that Michael is trying to take his political career seriously. It was also interesting to read this book at this particular time in history, when the parallels between what was happening in the mid-1920s and what is happening now, societally and politically, seem quite startling. The ordinary people are only concerned with what directly touches their money and employment and have become disenchanted with politics and politicians, seeing them as disconnected from the everyday concerns of the standard person on the street, and able to do nothing about the rising poverty and unemployment, and it’s left to the somewhat batty outsiders to offer practical solutions which just won’t work. The interlude, “Passers By”, sees some of our characters travelling, and there are some more Powell-like encounters where people are not expected to be. I can’t reveal more without giving out spoilers, but I can say that this does give a nice additional aspect to the story, and I don’t think I’ve read any but the first trilogy’s-worth of interludes before. Ali’s review is here, Bridget’s is here. This book will suit … well, it’s not really a standalone, but the series as a whole will suit anyone who likes a family saga or who is interested in society and politics of the early to mid 20th century, seen from the perspective of the upper middle class. In exciting 20BooksOfSummer news, I have finished my first book in the challenge, “Patricia Brent, Spinster”, and am on to the next one. But you’ll have to wait a few days for those reviews, I’m afraid. I am noticing that I’ve picked up books I might have bypassed for just one more from the TBR, so it does appear to be working! If you’re reading the Forsytes along with us, how are you doing? My friend Bridget kindly gave me this book from her collection and I was very pleased to own one of Leonard Woolf’s novels. And of course it’s a lovely Persephone Books edition, with pretty end-papers and bookmark, which just adds to the reading experience, with an interesting preface by Lyndall Gordon (more on that later). It’s a very interesting book which, while falling into a common Persephone Books theme of the suburban domestic and the plight of the unmarried daughter, also goes on, as so many of their books to, to look at wider societal changes and the fates of those who push against convention in whatever way, for however long. It was published in 1914 and apparently eclipsed by the war, and in many ways it is a very pre-war novel which could have been set any time from the 1880s onwards, as society began to shift and women became a little freer. In fact, one of the four daughters we meet here is described as being the kind of girl who would have been a New Woman a little earlier in history (instead she has to fill her time with golf and having a stiff upper lip about things – I presume she goes to work for the war effort, has a fine old time as an army driver and goes off to university in the 20s, but I’m digressing there and letting the characters out of their novel!). We meet four sisters, all unmarried, the eldest a slow-smiling copy of their mother, the second our golfing chum, the third having clumsy legs and a pash for the vicar and the youngest, Gwen, still unformed enough to be interesting to Harry, whose family moves in next door. Harry is shown being pulled between two worlds, as he tries to liberate and educate Gwen, giving her modern and disturbing books to read of which her almost-brother-in-law the vicar, always shielding the ladies from improper sights, heartily disapproves, while at the same time being jolted out of his own conventions by the Lawrence family, all massive armchairs and countryside reading parties, sensational conversations and startling daughters. Camilla is the main attraction here, even though her sister declares that she really shouldn’t get married, and she pushes against the conventional careers and lives for women, trying to get on as an artist (there’s a lovely passage in which one sister is described as painting when she should be writing and the other as writing when she should be painting; the fact that there are unconventional sisters who write and paint is also a key to the roman a clef nature of the book). Because yes, although I never read the Preface or Introduction before I read a book, for fear of the dreaded spoiler, these are indeed portraits of Leonard Woolf himself and Virginia and Vanessa Stephen, in the early years of Leonard and Virginia’s courtship. Lyndall Gordon, who has written on Virginia Woolf, has put together an excellent and readable preface which covers the background to the book and its (bad) reception by Leonard Woolf’s family, but it is best read at the end. The book is not a straight biography, though, as Gwen makes a sudden bid for freedom, comes over all peculiar and liberated and commits an act which leads her to defy convention and poor old Harry to get trapped between following those very conventions that he seeks to destroy and incite Gwen to destroy and having the courage of his convictions, as Camilla coolly continues to do. Which path will he take? The style of the book is interesting, with a certain amount of shifting perspective and stream of consciousness (although would this give you an echo of VW’s books if he were not her husband? Not sure). There’s a fair bit of metafictional authorial intervention as well, when he exhorts the reader to imagine the next few minutes for themselves or adds “a few more words” to flesh out a character. This makes for an attractive and engaging read which pulls you along into the story while making it fairly clear that we’re thinking about two separate strands of society here, and how one can navigate the path between them. Of course, Harry is the “other”, being Jewish and from a markedly and almost caricaturedly Jewish family, but thus maybe able to stand outside conventional society a little and be accepted as being a bit odd (although his father and mother certainly don’t like this). Although he’s a difficult character and gets in a bit of a tangle at times, you can’t help but warm to him, and although this is a novel of ideas and principles, it does never forget that warmth. Well, I usually do single-author challenges (starting with reading all of Iris Murdoch’s novels in order of publication, then Thomas Hardy’s, which overlapped with a re-read of “Dance to the Music of Time”, and now I’m reading all of the “Forsyte Saga” this year (my reading of Trollope is just an obsession, not a challenge as such). I also take part in All Virago / All August (which includes Persephone books!) every August. But I saw this one on Heaven-Ali’s blog today and thought it might be a good way to pick up some books that are associated with my TBR but not directly part of it, as well as chipping away at the To Be Read mountain. The challenge was set by Cathy over at the 746 Books blog (that’s the number of books in her TBR – eeps!). She’s set herself a challenge to read 20 books between 1 June and 3 September this year. Lots of people have joined her, and there’s a list of them on her challenge post. She’s kindly let me join a bit late – thank you again! So, here is my first batch of books. I have two to add from my Kindle, too … We are “allowed” to post mini-challenges of a few books at a time until our 20 is complete, so here goes with my first eight! “Sogur ur Biblikunni” – this is a book of Bible stories in Icelandic – for children – which I bought on holiday there in April. I don’t promise to have read all of this by September, but I want to have managed a couple of the stories in it. “Oxford Guide to Plain English” by Martin Cutts – I have a little pile of language textbooks that are to be read when I need to or feel like it. This is one of them, and also belongs to my “Reading a Century” project as it fills in a year. It’s time to read it! “To Kill a Mockingbird” by Harper Lee – I wasn’t going to, but I have got caught up in the excitement about the new Harper Lee novel, “Go Set a Watchman”, which is due out this summer. I really need to re-read “Mockingbird” before I read that one, and I think Matthew’s going to do the audio book, too. So I pulled this one out of the fiction shelves in anticipation. “The Act of Reading” by Iser – I’ve only had this since September, and regular readers will know but new ones (hello!) won’t, that I read my books in order of acquisition. I’m on November 2014 in my reading now, and I keep skipping over this one because I bought it for my research and it’s going to be Hard. But I am quite capable of reading and noting it, and I’m sure I can do so before the end of the summer, right? “Patricia Brent, Spinster” by Herbert Jenkins (not pictured: lives inside my Kindle) is another book that fills in an (early) gap in Reading a Century. Simon from the Stuck-in-a-Book blog heartily recommends it and it’s been sitting on my Kindle for to long. “Clayhanger” by Arnold Bennett (again, inside the Kindle) is the first in a trilogy, the third of which fits in with Reading a Century. So I do need to read those first two! 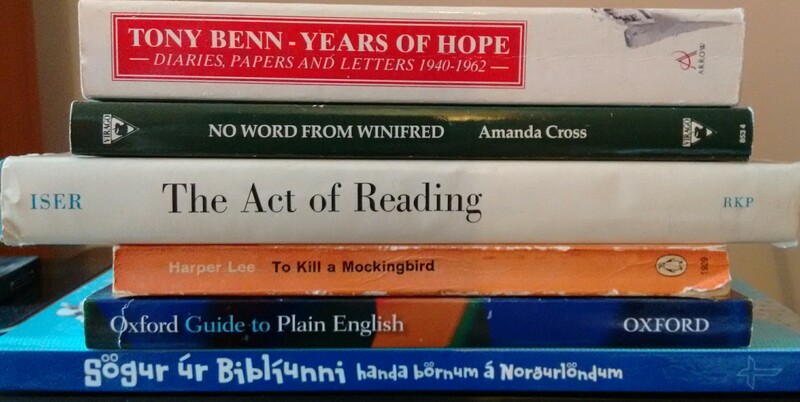 “No Word from Winifred” by Amanda Cross and “Years of Hope” by Tony Benn are simply the next two on my TBR – reminders that I do need to keep chipping away at that, too, because there are some very good books on there! So, hello to anyone new to my book reviews blog who has got this far and are any of my regular readers taking part in this challenge? There may be a book review coming later today, and I have at least 2 more (one read already, one part way through) before I’ll be reviewing for the challenge, so please bear with me. Anyone else got any (other) challenges on the go? Two books about reactions to literature today (shoehorns books together into one review). I can’t believe it’s 11 June and I’ve only got two to review, although I am part-way through another. I made heavy going of one of these, though, I have to say. Although quite a few people I know enjoyed Rebecca Mead’s book, it left me a little cold. However, the Robertson Davies was a delight, AND it gave me my 44th Reading a Century book – nearly half way!). I’ve been reading and enjoying the works of this Canadian author since the 1990s – I had a single copy of this novel which I acquired in 1997, for example. Most of his novels fall into trilogies, and I have unfortunately patchy cover of the trilogies, owning just one or two of each one, hence picking up this lovely omnibus last year. I highly recommend him to anyone who likes involved novels about communities with great characterisation and a slight wicked streak (oh – I’ve just remembered I used to add a “Will appeal to people who …” line to my reviews – when did I stop doing that? Did you like it?). Anyway, this novel is set in the city of Salterton, which outsiders think is quaint and insiders think is quite normal. We follow the members of the Salterton Little Theatre as they attempt to put on a production of “The Tempest”, with prodigal son, Solly, put upon terribly by his invalid mother, Hector the middle-aged maths teacher who suddenly acquires a desire to act and professional womaniser Roger vying for the hand of the rather static and uncaring Griselda, playing Ariel mainly because her father has been forced to lend his gardens for the affair. Griselda’s sister, Freddy, steals the show with her over-seriousness and wine-making – when she opens the novel, you know it’s going to be a good one. All of the characters in what is very much an ensemble piece are beautifully drawn, from the gardener, Tom, with his difficult surname and desire NOT to have his lawn dug up, thank you, to the dotty elderly lady who’s always “done” the stage makeup and needs to be prevented from doing any more damage. We switch viewpoints and allegiances as Davies digs into people’s characters and their formation, providing detailed or sketchy back stories as he sees fit. You’ll like this if … You like being involved in the world of a novel, a world rich and peopled with characters amusing and tragic and appealing and unappealing. You like reading novels. I don’t mind books that relate an writer’s life and works, and I like ones where the author follows in a writer’s footsteps, visits their haunts and houses, etc. However, this intensely personal book about the author’s relationship with “Middlemarch” went a bit too far for me, I’m afraid. The book follows the progress of the novel “Middlemarch” rather than Eliot’s life, which makes for some odd sequencing in that life, as she flits from death and reputation to times by the seaside, etc. The author also relates many of Eliot’s life experiences to her own, especially relationships with all of her boyfriends and then husband, and also claims that as well as the book giving her life lessons, her life teaches her to read the book in different ways, for example finding hints of Eliot’s life with her stepsons in a novel with none of these relationships. I feel that she weaves her life and the book together a bit too much – and that’s coming from someone who’s read the book several times and has indeed found it’s different in different stages of my own life (I used to think it was about love and marriage, now I think it’s about inheritance and politics, as I mentioned last time I reviewed it). There was also far too much conjecture for me – in one passage, Mead manages to invent three things that Eliot and her dining companions “might” have talked about, based on stuff that was going on at the time and things Eliot said about vaguely related subjects at other times in her life. I found this a bit much, and would have rather she stuck to the facts and known conversations. Mead lets slip that she did English Lit at Oxford at a time when Critical Theory was all the rage, and although she rather self-consciously “took to” it then, she seems to have eschewed it here, talking about readers making books in their own image and that image changing with time (fine), but relating herself and her experiences to her idea of the author and book rather than a close reading of either. There is good material in here on other people’s reactions to Eliot, but I would have preferred a straighter biography. I started thinking that I can’t be the audience for this book – but as a mid-40s English graduate with a strong liking for “Middlemarch”, I rather suspect that I am. I’m glad I bought this when it was on sale, I’m afraid. You’ll like this if … Hm … you have a high tolerance for loads of personal stuff and conjecture or you’re so obsessed with Eliot and “Middlemarch” that you’ll read everything about them. 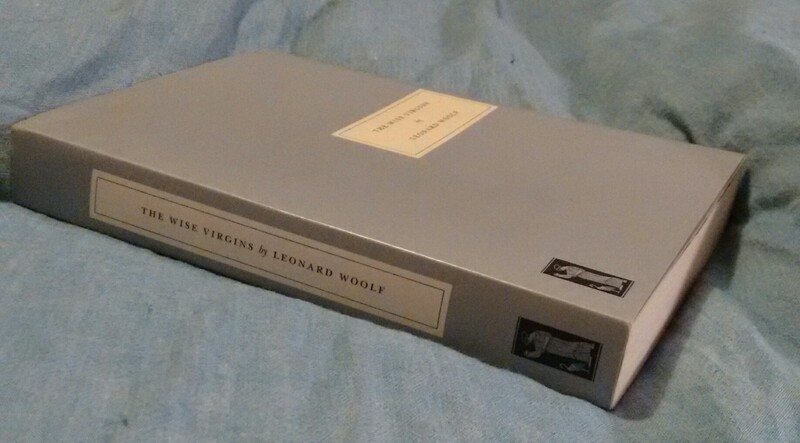 I’m currently reading Leonard Woolf’s “The Wise Virgins” but I haven’t got far enough into it to know much about it yet. It’s a Persephone and an attractive read so far. 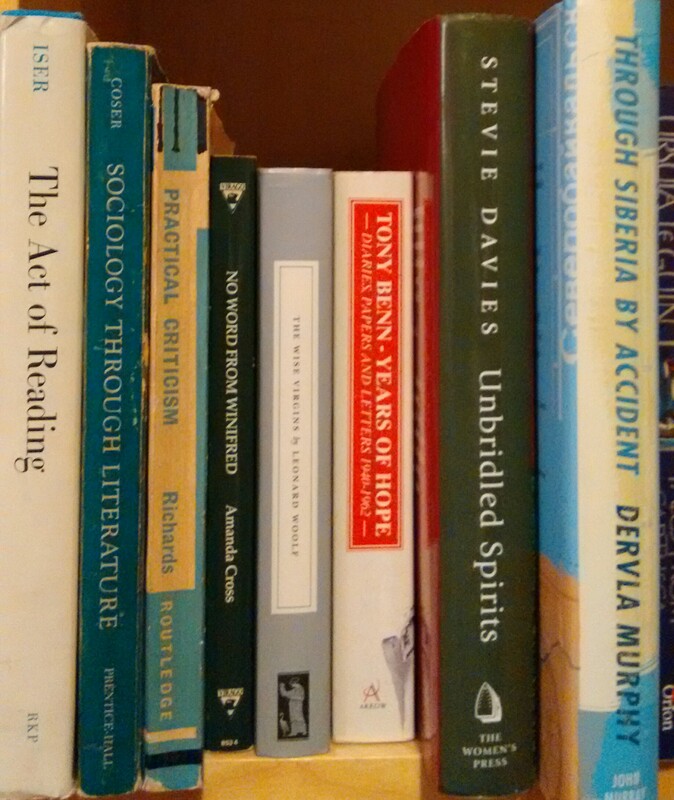 I also Came To A Decision and removed “Sociology Through Literature” and “Practical Criticism” from the TBR – they are going to live with my (OK, unread) tomes on bibliography that I acquired from the university library when it was weeding that section. I’m just not going to read them, although “The Act of Reading” I will read, as it’s a good source for my research. I have acquired a pile of Debbie Macomber novels from my dear friend Linda, however some of them are returnees, and two need a first one bought before I can read them – basically, I haven’t sorted them out or photographed them. Do you cull your TBR regularly? How’s your summer reading going? Lots of research material here! This is a book of “conversations with Iris Murdoch” – in effect collecting together the interviews she did with various writers and journalists over the course of her life, with a couple of pieces at the end describing visits to Murdoch in her declining years (I will admit to having read those when I was only half-way through the book in order to get them done and get the upset over with). It might seem strange for someone who goes on about “The death of the author” and Reception Theory in her research to mine such a book for bits she can use for her research, because what’s more author-centric than picking out what an author had to say about her readers? But I’d already gathered an idea that Murdoch was more on the readers’ side than the critics’, and actually the brilliant quotations I’ve picked up from this treasure trove will give me a nice section on how happy she was if readers got an escape, some joy, a story, or something deeper, out of her novels. Hooray! I would have read this book anyway, even if I hadn’t been doing research, of course. It’s wonderful to have all these interviews in one place, as they were published all over the place. Some concerns and interests remain through the years, and other opinions change; Murdoch is relaxed with some interviewers and pretty spiky with others, which is entertaining. Different interviews shed more light on her thoughts on psychoanalysis (good in a crisis, maybe a crutch long term), we also find clarification of her thoughts on freedom and goodness, as well as a lovely section on repeated characters in her works and the mention that she went to Iceland and enjoyed the thermal baths, which I didn’t know, as well as discussions of philosophy and literature and various of her books (she does like trying to tell people who the Narrator is in “The Philosopher’s Pupil”, however). I could go on – but there’s not really space. It’s a very well put together book, with careful bibliographical references, an introductory note to each interview, a good index and an excellent Introduction which pulls together the themes in the interviews. An interesting and useful read, and one I will re-read, too, once I’ve mined it for all of the quotations I’ve marked and got more of my research done! My friend and fellow blogger Heaven-Ali has been running a Mary Hocking Reading Week for a couple of years now, seeking to reclaim this slightly lost woman writer and get more interest in her. Last year I read the Good Daughters trilogy (search Mary Hocking in this blog to find all of my reviews), although not in the week in question, and this year I got all prepared by borrowing a couple from Ali in advance (I did comb all the charity shops I could find for her books, but just ended up with more books by other people – oops). “An Irrelevant Woman” takes as its theme the loss of role and identity that women can experience when their children leave the nest and their husband has other interests. Such women have options, such as being more involved in the community (Janet Saunders is not involved in her community), taking a course (she is not interested in taking a course) and other purposeful activities. But Janet starts to slip away, and what is called a nervous breakdown takes hold. What will her children, each with a family role and strong personality, her husband, enmeshed in his writing, her village friend, not liking to bear the burden, and the vicar and doctor, who would traditionally be the ones to save her, do about it? Does she in fact use her collapse to gain herself some breathing space, to claim something of her very own? The portrayals of depression and darkness, of panic and anxiety, are well done in that way that makes you cling on to the edges of your own reality as you read them (a bit like Lessing’s “The Golden Notebook”). But the overall feeling that I came away with was the heady redolence of the 1980s. The book was published in 1987 and the blurb on the back notes it as being “utterly contemporary”. It is very much so, with it’s concerns and discussions of nuclear threat, Greenham Common, CND, the Women’s Movement, Mrs Thatcher, the Falklands War … I think the book being in a contemporary Abacus edition makes it more so. I might have read this book back then; I certainly read other Abacus books and have them still. It has a strong feeling for me of my neighbour Mary’s sitting room, stuffed full of Viragoes and other books vaguely out of place in our stuffy village. I wonder if this very 80s-ness would make this book not so popular at the moment, when we’re all about the 70s, and whether another decade will see a resurgence in interest in such a very accurate portrayal of the times. Of course, Janet’s situation is very much of her time, too – old at 50, a “traditional” woman of a type that I’m not sure exists now. The other books I’ve read by Hocking have had a slightly distanced effect (in which she resembles Taylor and Pym), a vague coldness and view of her characters with a cool eye, from outside. This one has the same, which sometimes makes it a little difficult to engage with fully. The idea which comes through of doing small things that will help society is very useful right now, however, and the ending of the book, although obviously carefully arranged, brings some warmth and hope. An interesting read, so much of its time and reminding me of my dawning of reading proper adult books with adult themes. Quietly intelligent and having something interesting to say about women’s roles (all of the women in the book are strong, all of the men quite ineffectual) and robust about the anti-nuclear movement and “movements” as a whole, there is a lot in this book. Well, the actual TBR isn’t too bad, considering I haven’t read a huge number of books this month (8 read in the month, with two of those reviews to come on Tuesday; three were on Kindle) – I haven’t acquired too many, either, so that makes it easier. It’s a bit less petite than at the beginning of May, but never mind! I’m currently reading a non-fiction and a fiction book, the non-fiction book being on the Kindle, Rebecca Mead’s “The Road to George Eliot”, which is a book about the effect of “Middlemarch” on Mead’s life and her application of Eliot’s life to her books – which goes a bit against my ‘death of the author’ theory I subscribed to in my research, but then again, read the upcoming review for some major hypocrisy on my part there! 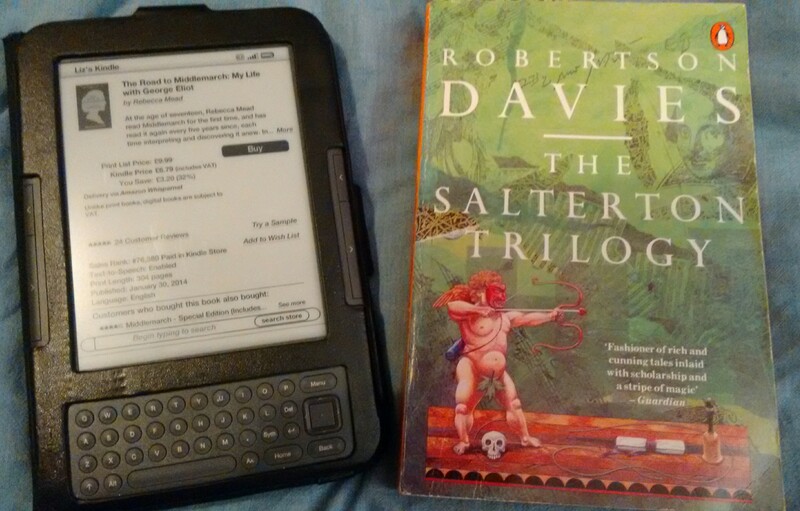 The other current read was started last night: Robertson Davies’ wonderful “Salterton Trilogy”. I’m not sure whether I’ve read all of these books before and I’m not certain whether I’m going to read all three in one go or one per month, but we’ll see how it goes. A writer to savour. Have you read his essays? They’re amazing, too. 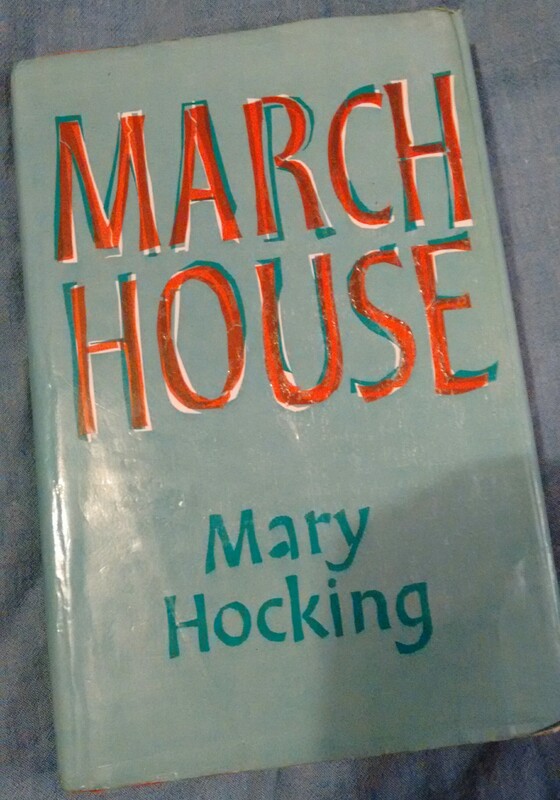 I also plan to read Mary Hocking’s “March House” as my second book for fellow blogger Ali’s Mary Hocking Reading Week. “An Irrelevant Woman” was an interesting read, very redolent of a particular period in time, and it will be interesting to see what approach this one takes (the other book will be reviewed tomorrow). Of course, I also have the next in John Galsworthy’s Forsyte Saga to read, plus my next Trollope (I can’t wait!) – those are, again, both on Kindle. After those, or while I’m reading the ebooks but want to have a print book to hand, I’ve got this rather diverse little selection. I have noted that the first three have been there for a while: now I’ve read a book of interviews with Iris Murdoch and I’m totally recovered from the flu, I think I’m brave enough to tackle these. Interspersed with something lighter, of course. 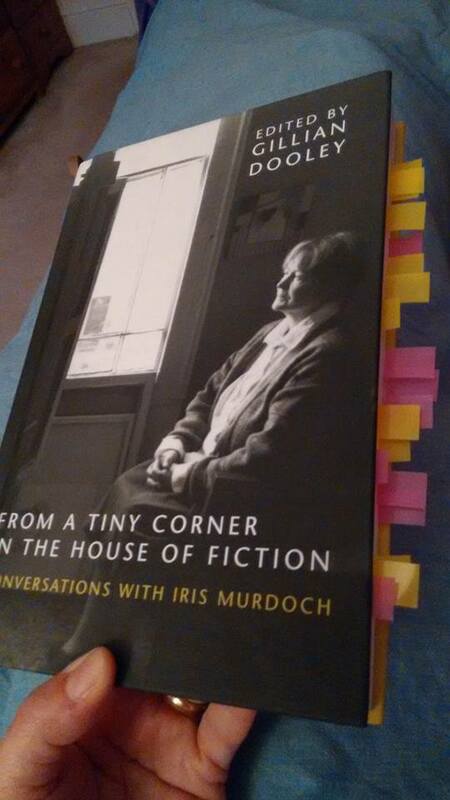 “The Act of Reading” should be useful for my research, so it’ll be out with the postit markers again for that one! What are you planning to read in June? Have you read any of my current and upcoming reads yourself?